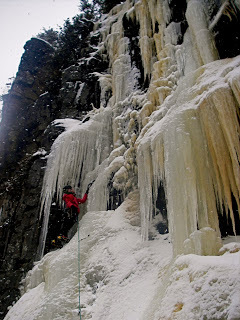 Early season ice climbing is something to get excited about and this year has not disappointed. Thin and mixed options are in abundance right now. The ice that exists is newly formed and has yet to see the full spectrum of temperature swings, so it’s more accepting of a pick. Early season requires a tempered, deliberate approach and mildly OCD behavior. The limited quantity of ice forces one to exercise all options, rock and ice movement skills and all forms of trickery for upward gain…over-tuned picks don’t hurt either. My season has already included a couple states and one province. My first day this ice season was on Pike’s Peak in Colorado, when Majka Burhardt and I drove, yes drove, to 13,000+ feet and enjoyed oxygen-lean ascents either side of the Corinthian Column. 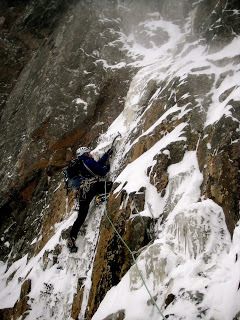 Blind Assumption and Total Abandon were the perfect combination of ice and mixed ground with chockstone cruxes and delicate verglas maneuvers that kept my mind slightly more engaged than my front points. The next icy outing was back home, on Cannon Cliffs, a playground that’s always on my mind in November. I’ve gazed fervently at ice reports, photos, and weather forecasts for the notches in NH while in dirtbag motels in the Canadian Rockies and wondered if I should have stayed home… are conditions really as good as they look? Will Omega come in overnight? I’d ask myself this not wanting to let my climbing partner know I’m questioning the current pilgrimage to “The Mecca.” So this year I delayed Canada and stayed in the Northeast. Silas Rossi, on the move and enjoying the mixed medium on Cannon, 2008. My first day out on Cannon this season was with Janet Bergman. We scraped and laughed our way up the Black Dike in temps that seems colder than they were, while watching the odd icicle plunge from Fafnir’s sunny top-out. The ice was great, but there wasn’t much of it– the protection was exclusively rock gear. We cruised into the partially frozen turf and hustled down the Whitney-Gilman descent trial driving directly to Rumney for a few sport pitches at to finish out the day–a November day in New Hampshire, indeed. 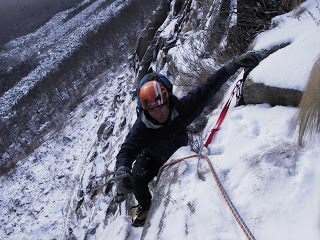 Two other Cannon adventures followed, the first with Silas Rossi, included a scrappy snow covered ascent of Wiessner’s Buttress later following the drainage to its left, topping out a few hundred feet south of the Old Man’s cable carnage. Another rapid ascent of the Black Dike with longtime friend and mentor, Chris Marks, saw him enjoying his first day out of the season runout over short screws, embracing spindrift and the experience of “Full Conditions.”A mixed day at Echo Crag was next, entailing quality climbing on Scottish Gully, Lip Service, and the Hermit Wall. Then, just prior to Thanksgiving, I made the rounds on Standard, Dracula, and the Penguin at Frankenstein. All were fully formed and fully enjoyable. Most recently, I’m back from the spectacular routes in Thunder Bay, Ontario. I only had a couple days there because I was en route driving through Canada (a story for another time) but the place was a blast. 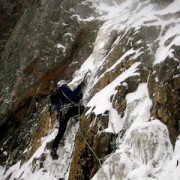 Majka and I climbed ice choked corners and chimneys in high concentration. Cedars iced in at the cliff edge made for worthy anchors and easy descents. I’d recommend this area to anyone. Majka Burhardt contemplating her line and cauliflower formations in the Ice Palace, Thunder Bay, Ontario.